Mike Lucas wants to know why he’s being sent to live with his grandparents. There’s some big secret that no one’s telling him. At least Poppa is teaching him and his mate Hone to sail. 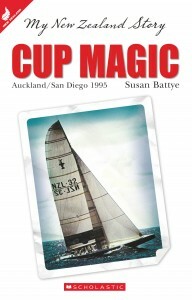 But then Mike learns the reason for the secrecy: his parents are working with the Team New Zealand boat builders for the 1995 America’s Cup challenge. And then he finds out that the whole family is going to San Diego! Everyone is wearing their lucky red socks and excitement is feverish … can Black Magic bring home the Cup?Mike’s fictional diary, providing background information on Team NZ’s 1995 challenge, will appeal to boys and girls as we gear up for this year’s America’s Cup regatta. My Story: The Mine’s Afire! Tommy Carter is a typical boy living in the West Coast mining community of Dobson in 1896, looking forward to the day when he will leave school and get a job. 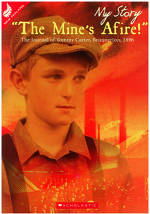 He’s not keen to follow his Uncle Fred down into the Brunner mine, with its hardships and ever-present danger. One terrible day, Tommy’s worst fears come true when an explosion rips through the mine. This fictional diary records the tragedy, heroism and bitter aftermath of New Zealand’s worst ever industrial disaster. 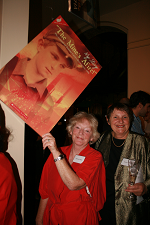 Susan Battye and Thelma Eakin are both interested in drama and social history, particularly the history of the West Coast. When they realised that their students didn’t know much about their local history, Susan and Thelma wrote a community-based play called The Shadow of the Valley, which was first performed in 1977. From this play came the idea to write about the event from the point of view of a boy caught up in a mining disaster that affected not just the local people but the whole colony.